Google has changed their API : MeetingBooster’s Google calendar widget for is not currently working. We are working on a new solution and hope to roll it out soon. Google Gmail has become a very popular email and calendar system, and organizations are starting to adopt Gmail as their system of choice. Luckily MeetingBooster has a dedicated Widget which integrates both emails and calendar appointments affiliated with a MeetingBooster activity. 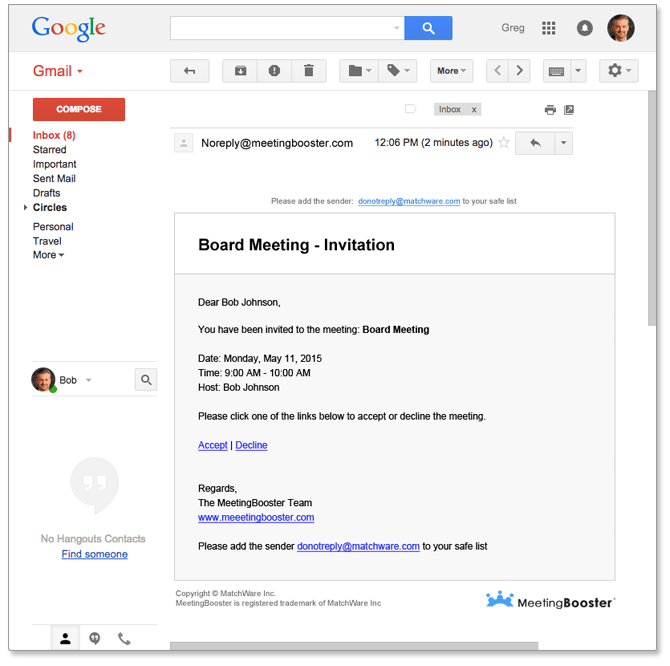 MeetingBooster’s Gmail widget installs seamlessly with your current Gmail account. By following a simple install process, users can benefit from a dedicated MeetingBooster Widget located in their Gmail side bar. This will contain quick links to the most important MeetingBooster features available in Gmail. 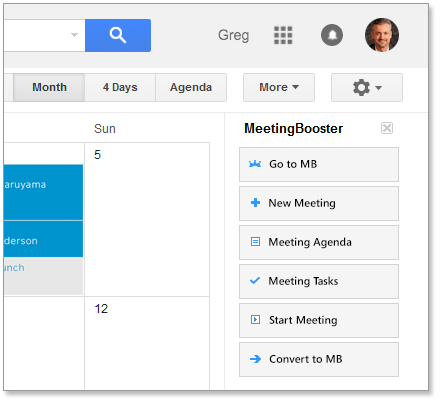 With Google Gmail becoming a popular email solution for many organizations and users, MeetingBooster’s powerful Widget allows users to schedule or modify MeetingBooster meetings directly from their Google calendar. Simply create a new meeting or update an existing meeting in your Google calendar and the Widget will take care of the rest. By installing the Gmail Widget, users will receive MeetingBooster emails letting them know of upcoming meetings, activities and more. Since many professionals already use Gmail to manage their day-to-day, there is a minimal change in habits allowing MeetingBooster to be adopted faster within your organization.